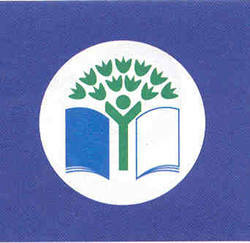 Our aim is to promote care for the environment and promote participation in environmental initiatives in the school. We will be organising a number of awareness campaigns and competitions throughout the year to draw attention to the importance of recycling, cycling and walking to school, energy and water preservation, reducing waste climate change and biodiversity. This year we will begin a number of new initiatives to work towards achieving our sixth green flag (the cbiodiversity flag). We look forward to the year ahead and hope we will achieve everything that we need. 1. We in Beaufort endevour to raise awareness of climate change issues, to get the school working as a community and to lower carbon emmissions. 2. To encourage recycling and waste and energy conservation. 3. To promote walking, cycling and carpooling to school. We in Loreto Beaufort, are committed to the implementation of energy efficient policies and practices. We endeavour to be a leading example to our wider community. We intend to instil a sense of stewardship in our pupils. We recognise the importance of sustainability for future generations. • The communication of this energy statement to the entire school community. • Setting realistic energy targets. • Liaising with the school green committee on energy and environmental issues. • Minimising our school’s carbon footprint, wherever possible. • Informing all year groups and staff about our energy initiatives. • Incorporating a sustainable energy plan for future infrastructural changes in our school. Recently, as part of getting our climate change flag, we composed a transport survey. We wanted to see what percentage of the school drive, use public transport and walk or cycle. The green committee distributed the surveys to each student around the school and after we compiled the results. Here are the results. We want to reduce the amount of people driving to school as much as possible so we encourage everyone within walking distance to walk, cycle or use public transport. 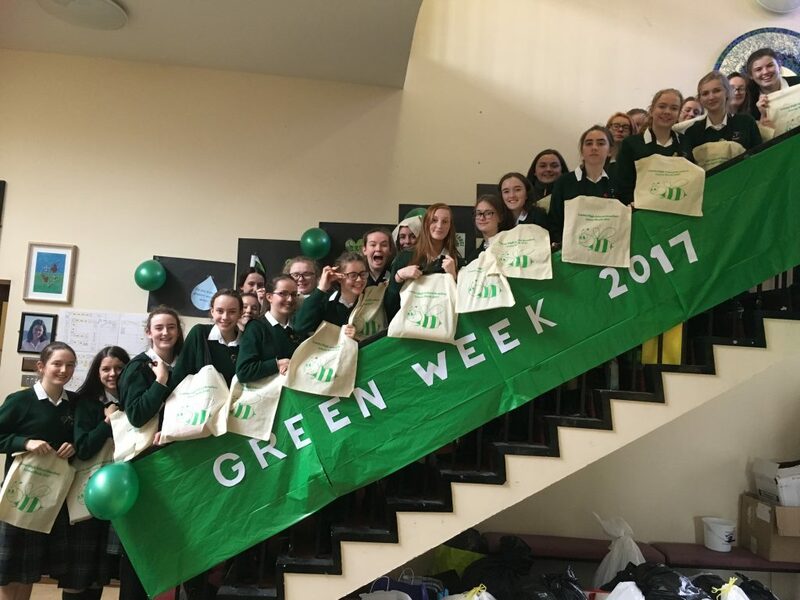 Throughout the year the Green Committee’s main objectives were to encourage cycling, re-cycling, walking to school, promote energy and water awareness and then ongoing work towards achieving the travel flag next year. The green committee commenced mid-September. Our first campaign was Walk to School Month, which we launched with Track ‘n’ Trainer Day on the 1st of October. This was a great success and the numbers walking to school increased. All the girls who participated were entered into a draw in which the winners received €20 vouchers for Dundrum. Photographs were taken during the award ceremony for the yearbook. Green captains were elected in October and were presented with their badges. 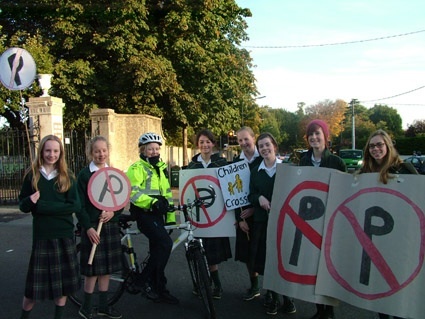 To promote safe cycling in the school, the green committee and the 2nd years decided it was necessary to patrol the school entrance and prevent cars from pulling into the cycle lane. In order to succeed in this, we called on the help of the Gardaí. They supported us by cycling on their bicycles outside the school. applied for a new bicycle shelter, which we have since received. Finally, representatives from W.E.E. came into the school to speak to us about the importance of recycling small electrical goods and batteries. 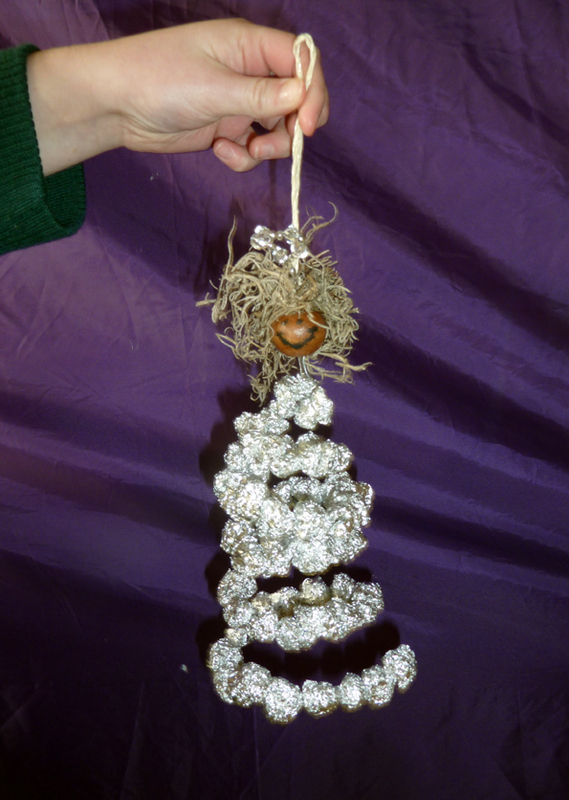 During the month of December, we announced eco- friendly Christmas tips over the intercom. We hoped this would cut down on waste over the holiday season. 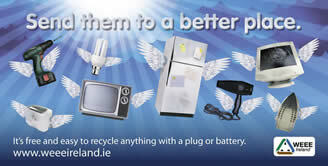 Battery recycling and small electrical goods bins were introduced for both the Christmas period and January. January saw the joining of 3 new green committee members from 4th year. We re-launched Keep The Cycle Lane Clear Campaign. We put up safe routes to school to re-enforce this initiative. With the ongoing water shortages in Dublin following the Christmas holidays, water conservation announcements were made daily. In February, 1p CSPE class did lots of mini action projects to help raise green issues in the school. We were notified that we had the opportunity to apply for ‘Beauty on the Bike’. We encouraged students to participate in WOW (Walk On Wednesday). eco-friendly make-up products and finally Earth hour was held on the Friday. In April we held Cycle to School Week. We promoted this by making numerous announcements and putting up posters. As part of the 2nd years ‘Power Of One’ campaign, they patrolled the school entrance and took note of the number of students walking to school. In May, the 1st years took part in ‘Beauty on The Bike’, where they learned bike safety and how to take care of their skin. Many 1st and 2nd years also attended ‘Dr Bike’s Maintenance Workshop’, which they found extremely helpful. This month also saw the 2nd years win the ‘Power Of One’ competition. The girls received I-pod touches and €1,500 for the school, which along with €500 from the green committee, we will be purchasing a water harvester for the school. We would like to thank all the green committee members and those who took part in activities this year. A special word of thanks to Ms Dunne and Ms Bowe who played a major part in the achievement of all our goals this year. All efforts made to reduce your carbon output/footprint is much appreciated. Try to cycle or walk to school and remember if you do get a lift or drop your daughter to school please do not pull in and block the cycle lanes. This is an offense and a hazard to pedestrians and cyclists alike. Gardaí will be patrolling the area at peak times and you could get fined or receive 2 penalty points. Remember to use the recycling bins correctly. Thank you for your continued support. The fourth years are working with the WEEE initiative over the coming weeks. They had a guest speaker in from WEEE to talk to them about this scheme. There will be special blue bins where you can recycle small electronic equipment. There will also be battery recycling bins. So send your old mobile phones, irons or T.V’s to a better place – put them in the blue bin and the school will get them recycled for you.